. Sign up your child for the Living Nativity Procession, Sunday, December 16 at 5pm in Church. 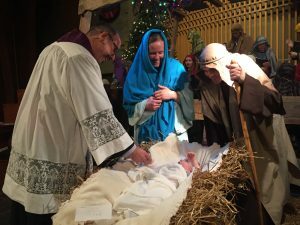 The Living Nativity on Sunday, December 16 at 5 p.m. is a joyful event telling the story of the birth of Jesus Christ through song, scripture narratives, light acting, and live animals. 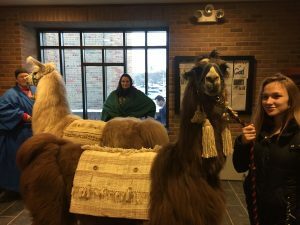 Reminiscent of the re-creation of the Nativity scene by our patron, Saint Francis of Assisi, the event in church is followed by a procession to the gym for more animals, the stable, and refreshments. Invite your child to be a part of the Nativity! Sign up here. caravan. Middle School and High School Youth help in a variety of roles. Parents, please provide a simple costume for your child. The Nativity will take place in the Church and the Gym so no need for worry about the cold. Angel Choir (Children K-8), dress as angels (or in period costume) and sing for the Nativity. Rehearsal times TBD. Angels (grade PreK (4yrs)-K and 1-5) rehearse on Sunday, December 9 at 2 p.m. in church. Shepherds & King’s Caravan (grade K-5) rehearse on Monday, December 10 at 6:30 p.m. in church. Contact Ellen Ward at ward@stfrancisa2.org or call 734-821-2130 for questions.